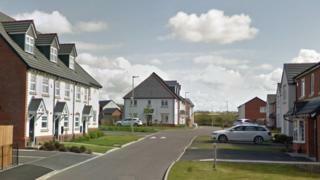 A one-year-old girl has died from head injuries, prompting a murder investigation. She was taken to hospital on Thursday after Greater Manchester Police (GMP) were called by medical staff, and she died on Friday. A 32-year-old man has been arrested on suspicion of murder and is being questioned in custody. Police said forensic teams were searching a property in Fleming Court, Shevington, Wigan. Det Ch Insp Jamie Daniels, of GMP, said: "All murder investigations are understandably upsetting but, when it involves a child as young as this, it's particularly distressing for everyone involved." He appealed for information, adding: "We are currently trying to build a picture of what has happened in the lead-up to this little girl's death and how she has come to sustain her injuries. "Specially-trained officers continue to offer their support to loved ones at this terrible time."